The main portfolio of activities for the Energy Exhibit are organized around simple machines, math and measurements, as well as conservation-inspired practices, including kumeyaay cosmological and mythological energy-related activities. The design for this exhibit includes two main environments: The Energy Garden and the Geo-pole Garden. This environment includes the reuse of an existing metal canopy on the West end of EarthLab, adapting its circular structure and footprint into a dynamic set of interactive spaces and amenities to support energy-related experiential learning. The main features of this exhibit include, a Celestial Solar House, the Simple Machines Swing Zone, the Kumeyaay Sun-Walk and the Energy Forum. The Solar Energy House will respond to specific “calls to action” that are supported by other school-based and community-based climate action initiatives led by Groundwork. 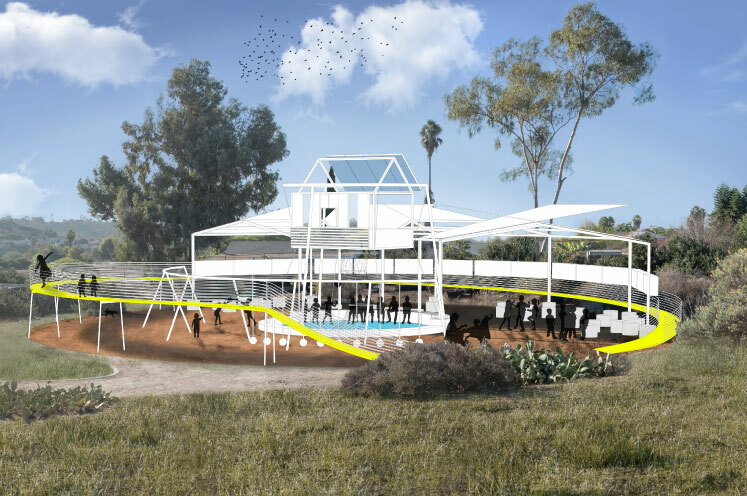 The Solar Energy House is designed as an open air atrium surrounded by an elevated concrete bench in the shape of a small amphitheater enabling children and mentors to gather for more directed instructional guidance, focusing on solar energy technology-transfer processes. This is not a conventional solar house that sits on the ground, but the house is lifted in order to open its main components, following the pedagogical premise that to understand something you have ‘to pull it apart’ and then recompose it back together (after visiting the outdoor solar house, students make miniature models of it back in the classroom). Visitors can see the house from underneath where all the elements essential to PV performance are exposed, enabling them to follow -visually and experientially- the sequence, from capturing solar energy, the journey from panel to transformer and into electric outlets. While the house is elevated, the slab has been left on the ground serving as information board with visually accessible illustrations about energy consumption information and the role different materials play in maximizing energy transfer into a system. this slab also serves as pedestal for interactive tools to amplify concepts of energy consumption and transfer, as well as water usage. Here there will be installations such as toilets and showers made of resin, so children can understand the amount of water used for a single flush or a daily shower, etc. Additionally, the circular space that frames the solar house’s slab acts as a water-rain collector, where the roof-planes that shade the Energy Forum drain into. This introduces children and their families to green infrastructure solutions to better manage storm water runoff and how to filter it and keep natural bodies of water clean for the organisms that depend on them. This area is designed to accommodate a variety of out-door equipment that has been fabricated to perform as a pedagogical playground that supports interactive play and learning. This area introduces the children to main ‘simple machine’ concepts such as pulleys, levers, inclined planes, wedges, screws, wheels and axles; as well as ideas of measurement and math which are facilitated by the shape of the tubular lines, which are tactically organized as curvilinear, rectilinear and angular configurations, at different heights and lengths, with printed information to follow a variety of measurement, math and geometric narratives. The mathematical and geometric information inspires cartographic and measurement experiments back in the classroom. This is an inclined plane in the shape of a continuous ramp, allowing children to go up gently and look down into the Energy Exhibit’s main areas. The circular shape of this catwalk wraps the Solar Energy House with a ‘solar promenade,’ allowing visitors to circulate through a sequence of mini-stations along the ramped pathway that introduce them to interactive ‘sun-narratives,’ including cardinal directions in relationship to the sun’s movement, compass angles, sun dials, and degrees of light and shade. An important part of this area of the Energy Education Zone is that the sun-catwalk introduces a graphic system of symbols and signage on the ground of the exhibit, allowing the children to visualize from above the entire circular footprint of this environment, which transforms a large-scale Kumeyaay cosmological map. 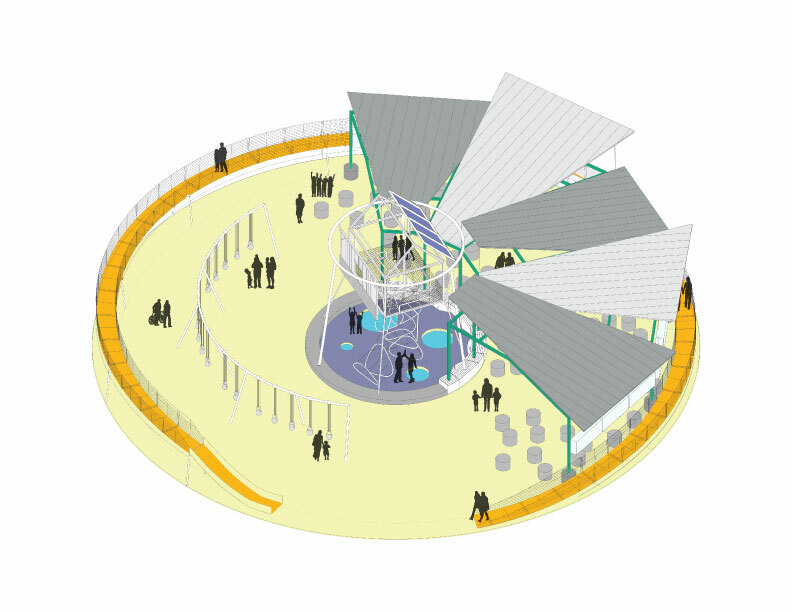 The Energy Forum comprises a large area that is covered by large roof canopies to provide shade to 1/3 of the entire circular foot print of the Energy Garden. This area is design to accommodate large groups of students distributed across different meeting clusters, where benches, movable chalk-boards and tool-storages can facilitate out-door instruction. The roof canopies, radiating from the center of the exhibit, alternate in their inclination, to create a dynamic shaded environment, but also serve to illustrate water collection and solar reception in relation to the central atrium, where the Solar House is located.